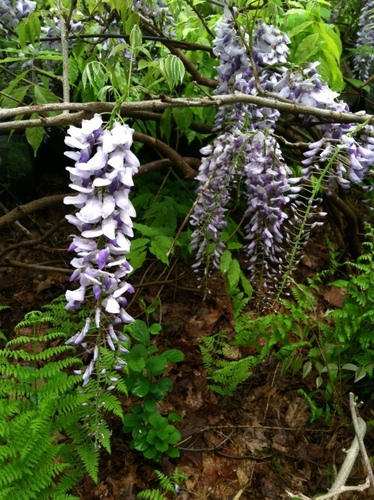 This wisteria vine is growing along the walk I take most days. 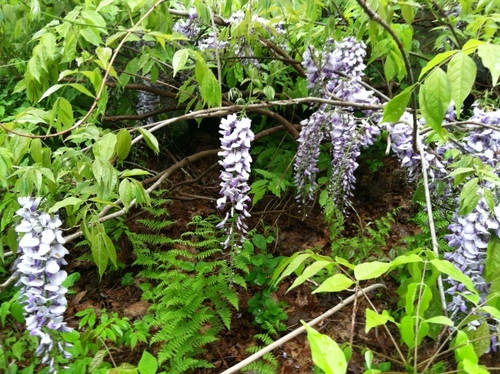 This and the azaleas and the spring green of unfurling ferns are what lures me outside each day. I will enjoy playing with these two images for a tapestry cartoon, even if I never actually weave them. Back at home I discovered a few mushrooms from the recent damp weather. I’ve cut them and brought them in for identification. I think they are Agaricus arvensis which are very common gilled mushrooms. 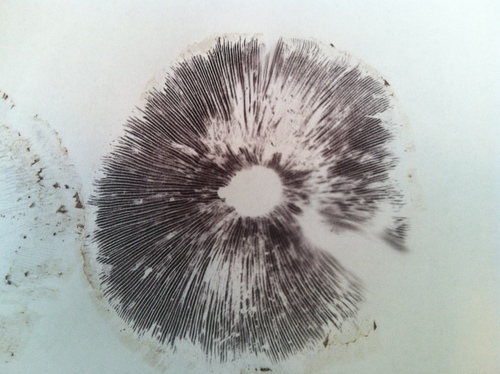 Part of identifying a mushroom involves getting a gill print on white paper (or black paper if the gill print is white). This gill print is a deep grey tinged with purple, very similar to the color of the gills themselves as you can see in the photo above. This mushroom mostly gives tan, beige and grey in the dyebath; not too exciting since wool naturally comes in those colors. But if I mordant with tin (and yes, I do have that) I might get a golden brown. I’ve got 12 oz. 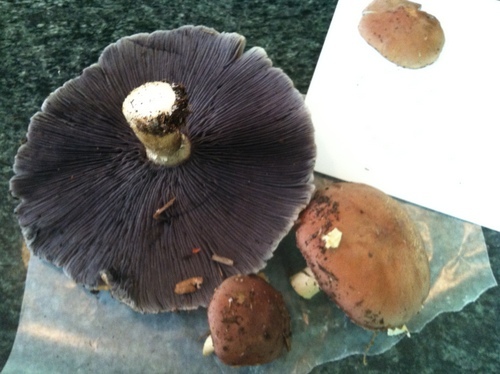 of mushrooms, so it is a bit tempting…. and I actually remember where my dye pots are! And there is news of Bob today. The wind continues quite favorable for sailing, and he is now in the Gulf Stream so that current is pushing Pandora to speeds over 10 knots. He is WAY offshore, but roughly the same latitude as the southern part of Georgia. That’s a lot of ground covered in 48 hours. This entry was posted in dyeing, inspiration, tapestry. Bookmark the permalink.